Aspen Excelsior is a great medium for craft and gift basket projects. It is the perfect filler for gourmet gift baskets, wine crates, fruit gift boxes, packaging cushion, premium animal bedding, display material, etc. 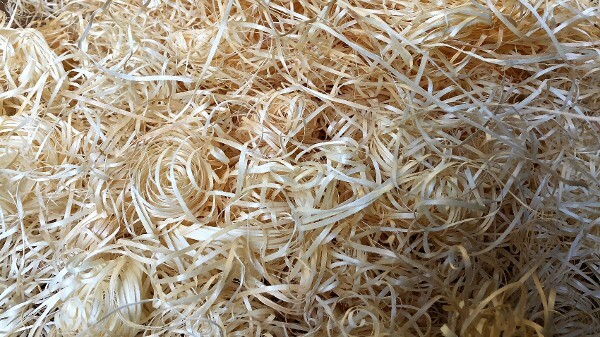 Our blend of blonde and light beige shredded aspen wood fiber is soft, curly, and cleaner than other excelsior on the market. No more challenges with coarse, hard, splintery, “feels-like-sticks” baled excelsior anymore. This is an all-natural and biodegradable alternative to crinkled paper, which requires the use of chemicals to manufacture. Also, Aspen Excelsior doesn’t pack down the way crinkled paper does. Choose “Aspen Excelsior Regular” cut for basic need projects, or “Aspen Excelsior Fine” cut for special projects where a finer grade of excelsior is desired. Available in a small case (18” x 16” x 8”), or in a large case (20” x 20” x 18”). Barlow’s Exotic Birds -- For bird nesting. Barron Bears -- To hand-form the bear body. Bordin Bees -- Aid the queen bees when they are feeding. Iron Works Production -- Used in a scene of the Iron Man movie. Ladybugs, Ladybugs -- Shipping medium for the ladybugs to crawl around. The Suite Life of Zack & Cody TV Show -- Used in their episode titled “I want my Mummy”.